Line large baking sheet with parchment and preheat oven to 450°F. Roll the dough on floured surface to create a 9-inch diameter circle and transfer dough to the prepared sheet. Make indentations all over dough with fingertips and brush melted butter over. Bake until golden, approximately 20 minutes. Smooth the chocolate-hazelnut spread over hot crust and sprinkle all the chopped chocolate on top. Bake for about 2 minutes, until the chocolate begins to melt. Sprinkle chopped hazelnuts over, cut into wedges, have a break from baking the best pizza ever made, serve to a lucky group of people and enjoy. Make it even sweeter by adding some fresh fruit on top. 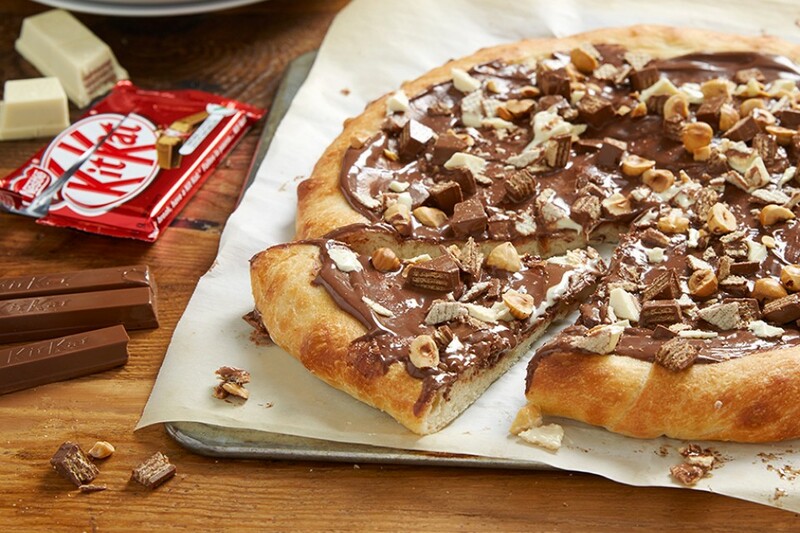 Use your favourite flavour of KIT KAT for a personalized pizza.